The Edge: Can the opposition win the coming [general] election? 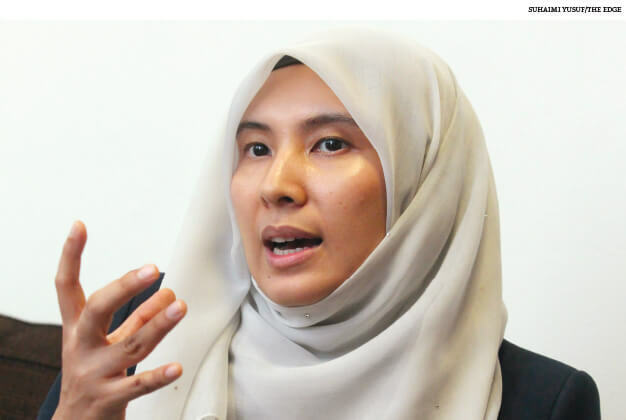 Nurul Izzah Anwar: I’m confident [we will win] if we manage to get our message down to the grassroots. How different is it this time around from the past? I have never seen a time when Umno’s [popularity] is at an all-time low. So, it really is prime for the picking. The breakup of Umno is not being highlighted enough. Bersatu has gained a lot of momentum in Kedah [due] of course to [Tun Dr] Mahathir [Mohamad]. Regardless of how people view him in the past, but for a 92-year-old man making the rounds, people do come out to listen to him. The impact of [Datuk Seri] Anwar [Ibrahim] and Mahathir coming together — it goes beyond politics, it goes beyond winning the elections. It is us as a nation coming together to build a future — focused and committed to reform. The opposition is in disarray, isn’t it? If you take PAS out of the equation, we are stronger together, we are working very closely. And discussions are taking place at different tracks — whether it’s the manifesto negotiations, policy pronouncements, [or] quick, clear-cut pledges — to showcase what we mean by a coalition committed to reform versus a coalition committed to kleptocracy. But if [PAS] decides to combine forces with [BN], it’s their choice. Amanah took a conscious decision to set up a new party because it knows that the electorate wants it to be in a coalition with us. And we (PKR) had to put aside our personal suffering and differences with Mahathir when he set up Bersatu and we agreed to embrace them. On PAS, I would say there will be different dynamics playing out in different states, for sure. Officially it decided to break away from us and destroy the existing working relationship [but] there are some state assemblymen from PAS who are very friendly to us. I completely agree with you. Mahathir ruled with an iron fist and we have to state this. And there were consequences of these actions — people suffered. And it’s not just about Anwar; it’s about the entire system, the entire generation. Then you see him changing position and adopting the reform agenda. I’m not going to be the one to exclude anybody from supporting the reform agenda. You have seen what politics is all about… you opposed Mahathir and then in a moment he becomes a friend and a comrade on the battle field. It has been a long time, and I think it was not easy… it’s not a personal issue per se, but it is also about how you approach it. When I decided to be part of Keadilan, [it was] because I supported the reform and multiracial agenda. I wanted us to succeed beyond Anwar’s release. You can’t be leading with a chip on your shoulder. I never hated the man, I hated the actions... separate the two. Where do Sabah and Sarawak fare in the equation? I’m more optimistic about Sabah. I think we have to understand the whole issue of autonomy — the fact that they want to be leading the charge for their own destiny, for their own future. In [Datuk Seri] Shafie Apdal (former Umno vice-president), we have a hard worker and he’s been instrumental in bringing momentum. On the ground, do the grouses of the voters tally with Pakatan Harapan’s manifesto? What are the people unhappy about, actually? Is it corruption? Is it the high cost of living? We are actually tracking these issues every week. In Selangor, we have done quite an in-depth study on what voters want on a weekly basis. For example, they want efficient garbage collection and Selangor has addressed this. One of the reasons [Datuk] Azmin [Ali] managed to get a 67% popular support is that from the beginning, he had tracked what were the top five issues the voters are unhappy about. What is your sense of the Malay heartland? The Malay heartland, especially the Felda seats, we need just a few percentage points’ swing — 5% to 7%. With the problems faced by Felda, it’s ripe for the picking too, but we have to be strategic. Maybe it is better for these seats to be taken up by Bersatu. What urgent measures are needed for the economy? One key thing is how much we have lost to corruption and leakages. But I would also like to focus more on the crisis affecting our education system. We are cancelling the overseas government scholarships [for qualified university students] who will form the next generation, the talent of this country. If you can arrest leakages, you can have [the funds] to continue with these scholarships. Are you going to remove the GST, are you going to put back petrol subsidies? We have a group working on this. I am all for 0% GST, but how do you dismantle a system that has been implemented? Taking off the GST regime needs to be done gradually. I have no issue with BR1M per se or targeted subsidies, but you can’t be making them part of continuous government policy without an exit plan. Some people are concerned that the opposition lack the experience to run a country. Who is controlling Penang and Selangor? Malaysia [under Pakatan rule] will definitely be an extension of Selangor and Penang.